During our summer trip to Japan we visited many of the country’s famous attractions. Every now and then, through, I dragged my kids a little off the beaten pass to see some textile-related wonders. 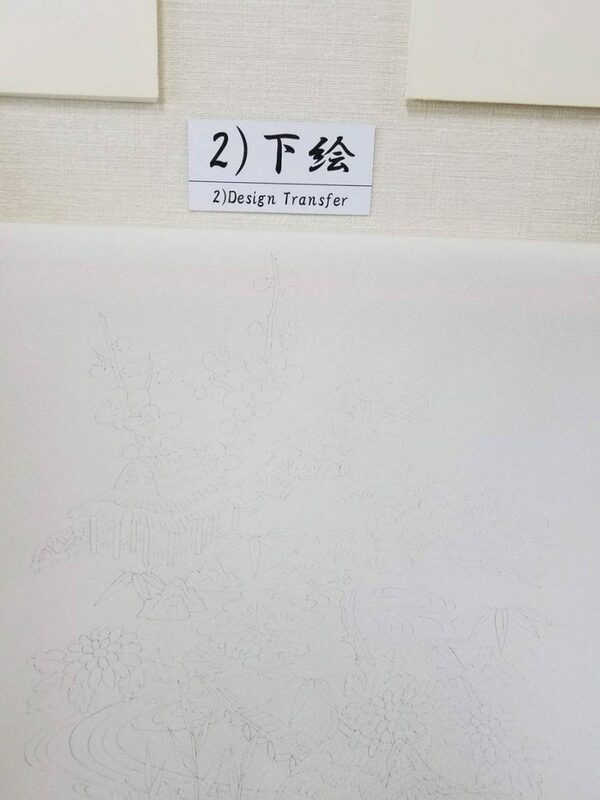 This is how, during our visit to Kanazawa, we ended up in the Nagamachi Yuzen-kan Silk-Painting Museum. Housed in a modern, indistinct building in the Nagamachi district, the museum was a bit hard to find. Although not big, it was very informative, and is a worthy stop for any textile-loving tourist. 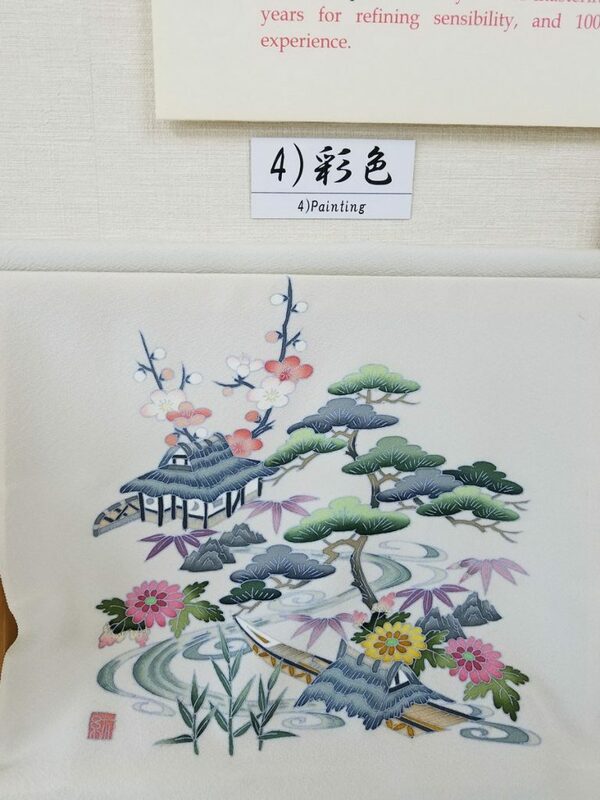 The first room in the museum depicts the process of silk painting, describing each stage of the process in both Japanese and English (!). The second room displays some spectacular samples. The museum also has a small gift shop that sells some hand-painted items. 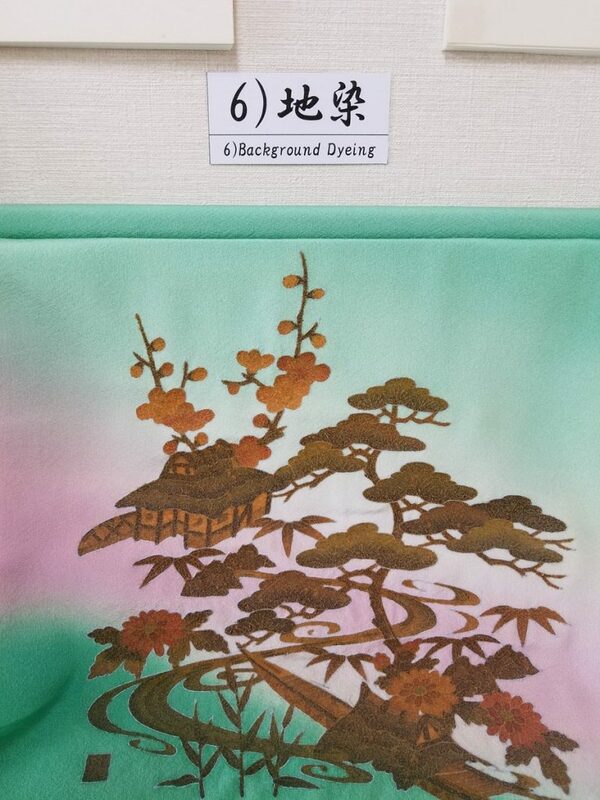 Hand-dyed silk is a work of art that requires many hours of work by several highly-skilled artisans. Since I assume some of you might not be able to visit the museum, I thought I’d give you a virtual tour. All the explanations below are based on the signs in the museum. 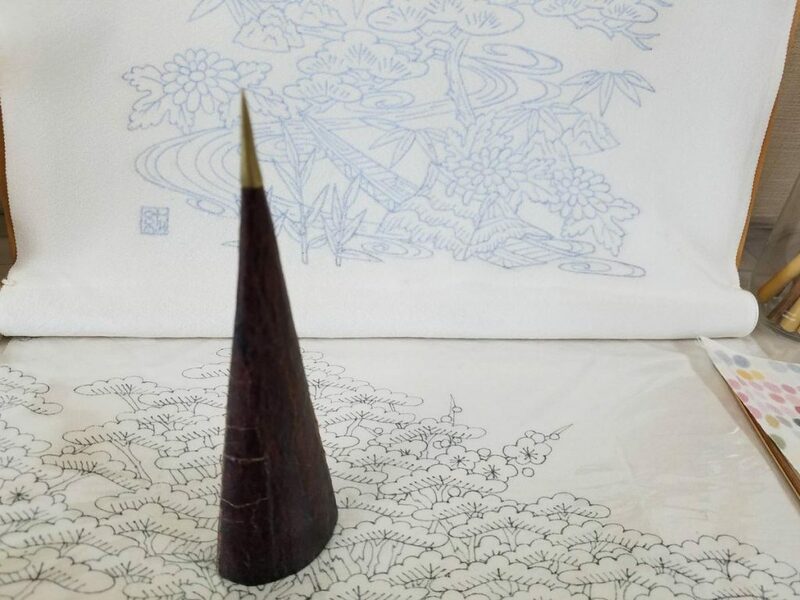 The Kaga Yuzen designs combine traditional design elements with the artist’s observations of nature. 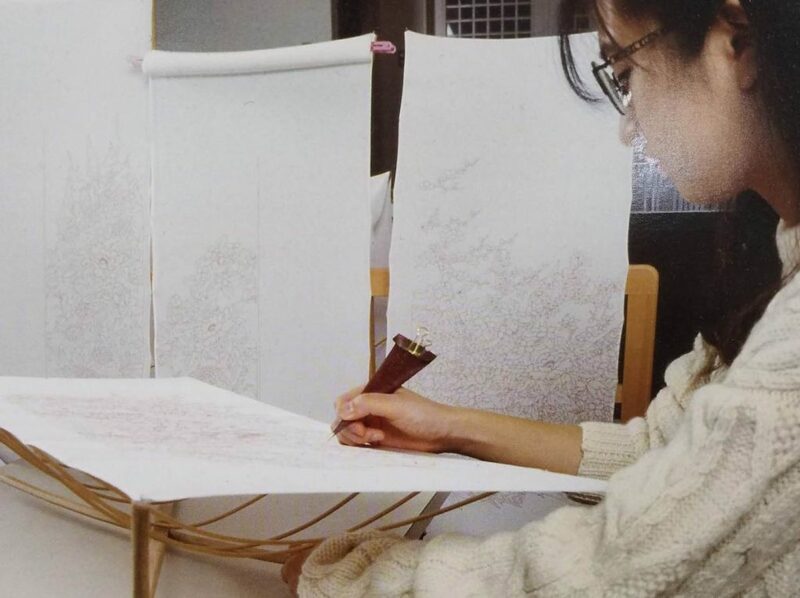 Each design starts with a pencil sketch on paper, in the same size it will eventually appear on the finished product. 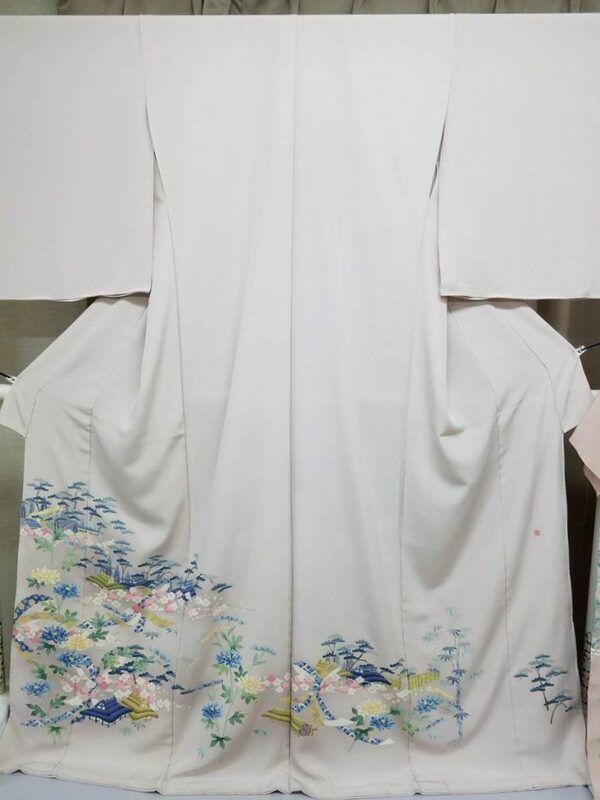 Once finished, skilled artisans trace the design onto white silk. They do this with fine brushes and blue ink, and use a steady hand to draw flowing, evenly-thin and quick lines. 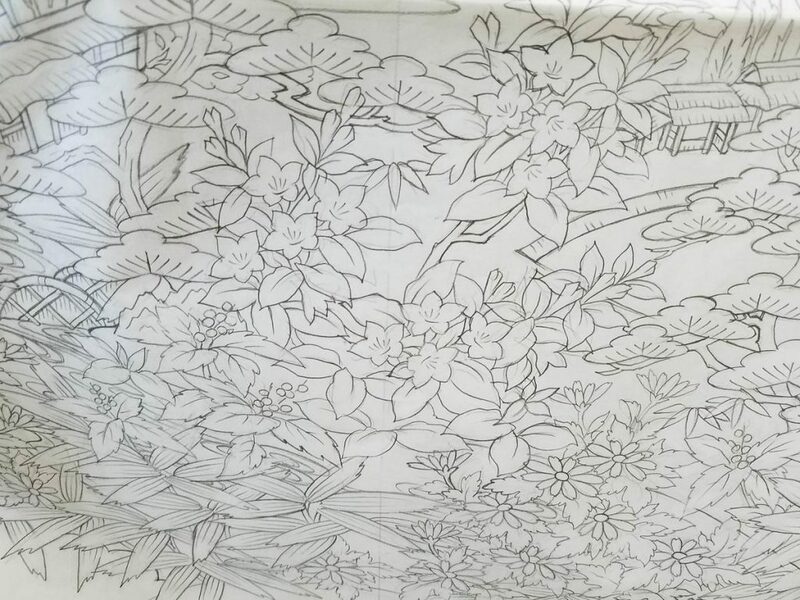 Then, artisans apply a thin line of rice paste onto the sketch. They put the paste into a Japanese paper tube with a brass tip, and squeeze it out (similar to how many of us decorate cakes). 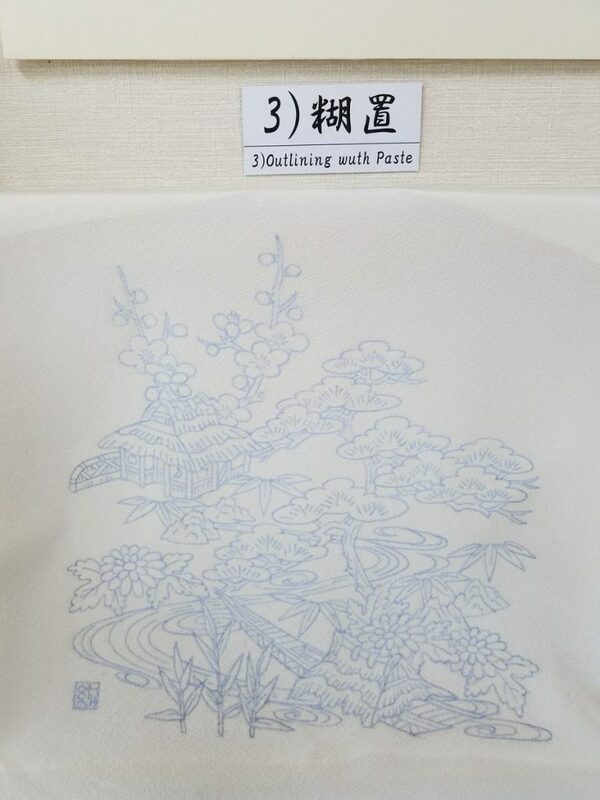 After they cover all the lines with paste, they spray the silk with water and then let the paste dry. 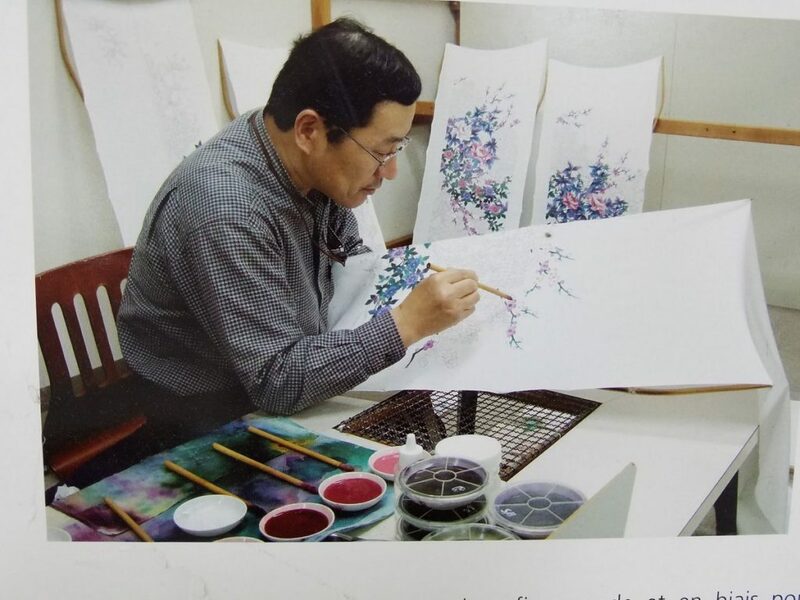 When the design in all painted, artisans carefully cover it with rice paste before moving on to dye the background color. 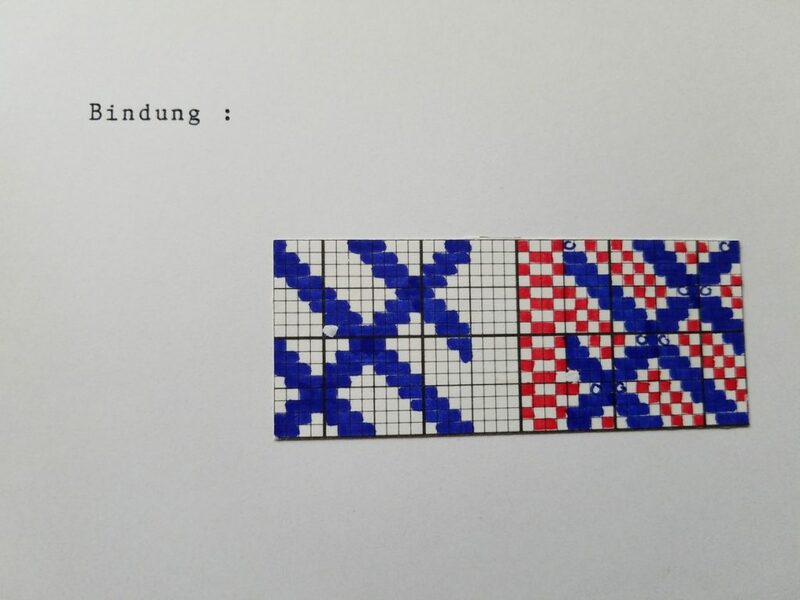 They have to do this with great precision, so that no white patches are left. 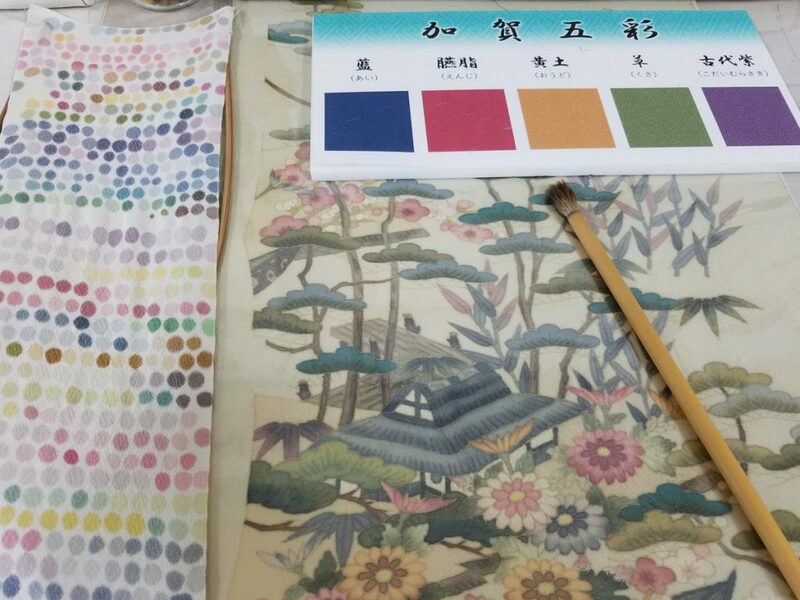 After they cover the design with paste, the artisans dip the silk into soy bean juice to prepare it for absorbing the background dye. A day later they use large brushes made of deer hair to evenly apply the background color. They let the color dry slowly, and repeat the dyeing several time to achieve an even dye. 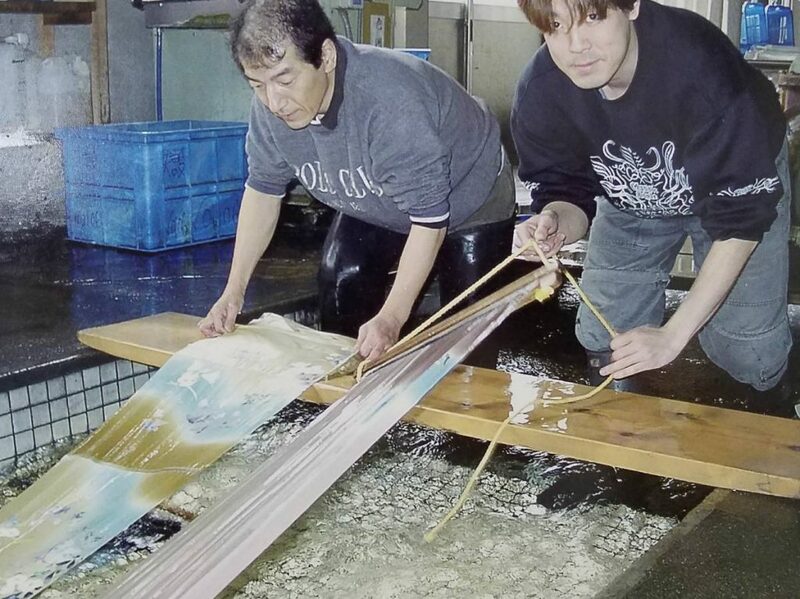 Then, they put the silk in a large steamer for about an hour to set the colors. This, too, requires skill and experience. 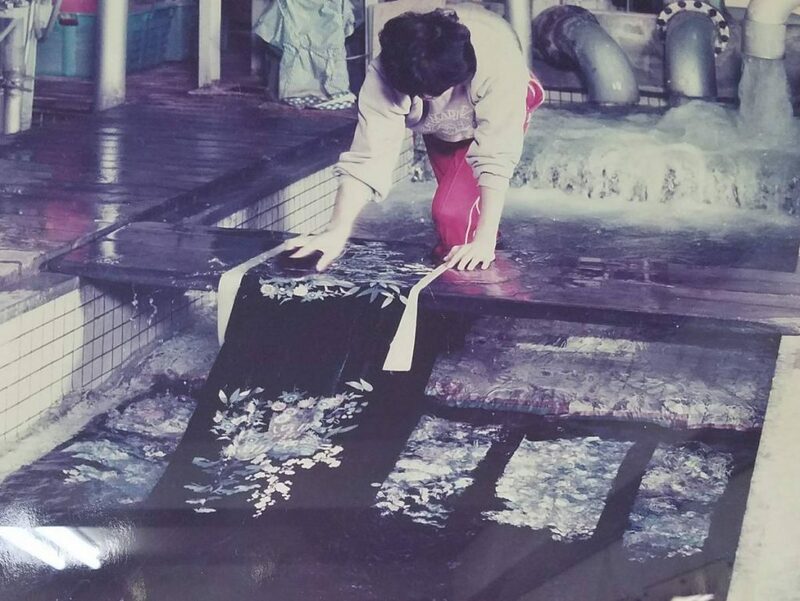 After steaming, people immerse the cloth in water to wash off the remaining paste and access dye. And the fabric is finished! 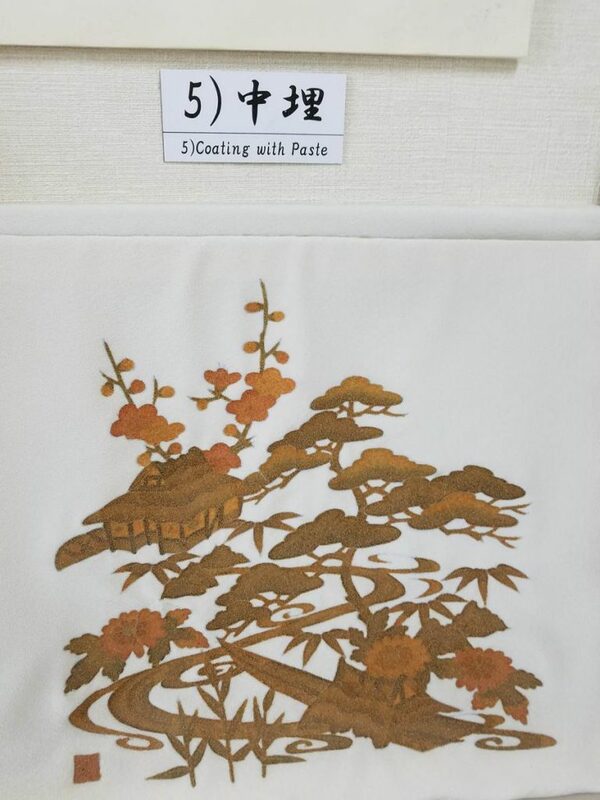 Artisans use the painted silk to make screens or sew kimonos. This first room had a little staging area for visitors to make-believe and take pictures. I couldn’t resist 🙂 My kids love it, too! 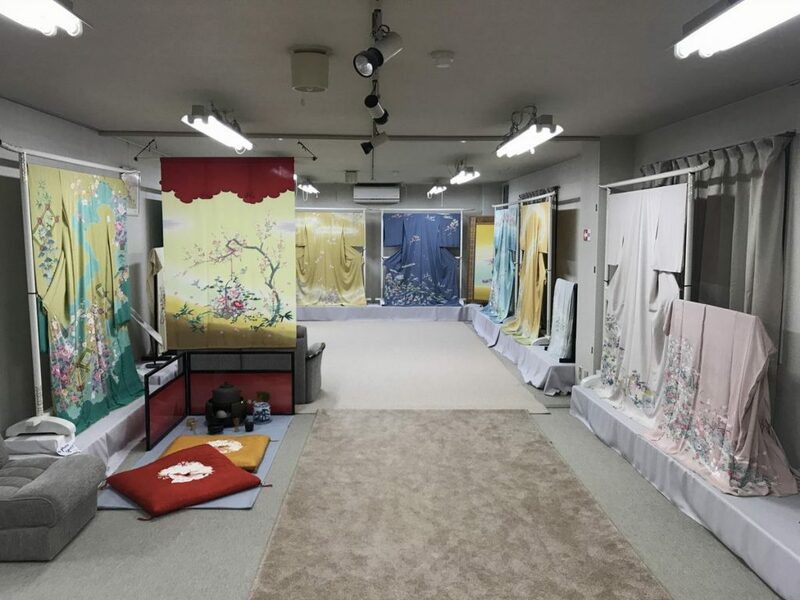 The second room in the museum, as I mentioned above, has some exquisite samples of both painted screens and kimonos. 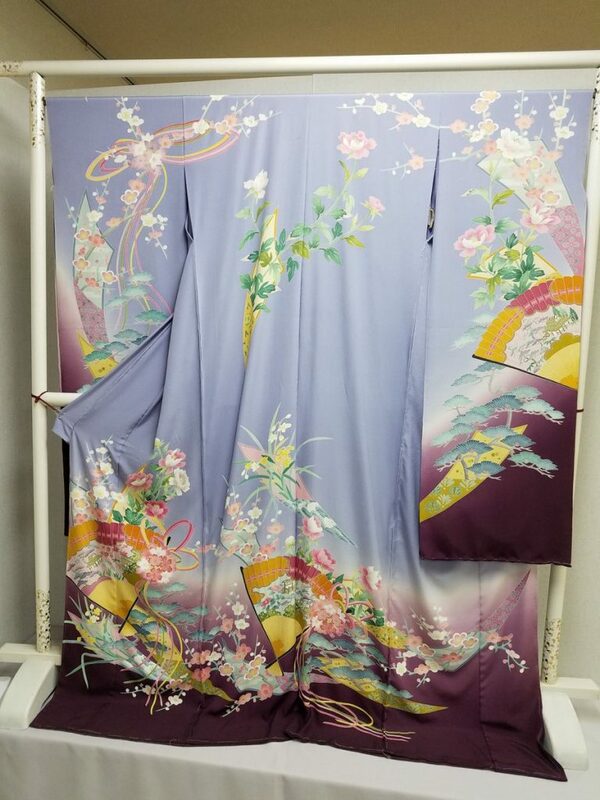 Japanese buy a hand-painted kimono for several tens of thousands of dollars (!! ), mostly for special occasions like weddings. FabMo is the amazing non-profit organization from where I source most of the luxurious designer home-decor fabrics I work with. Many people in my area know what a fabulous resource FabMo is, and purchase fabrics there. Only a few, however, realize how much behind-the-scenes work goes into making these fabrics available to the public. 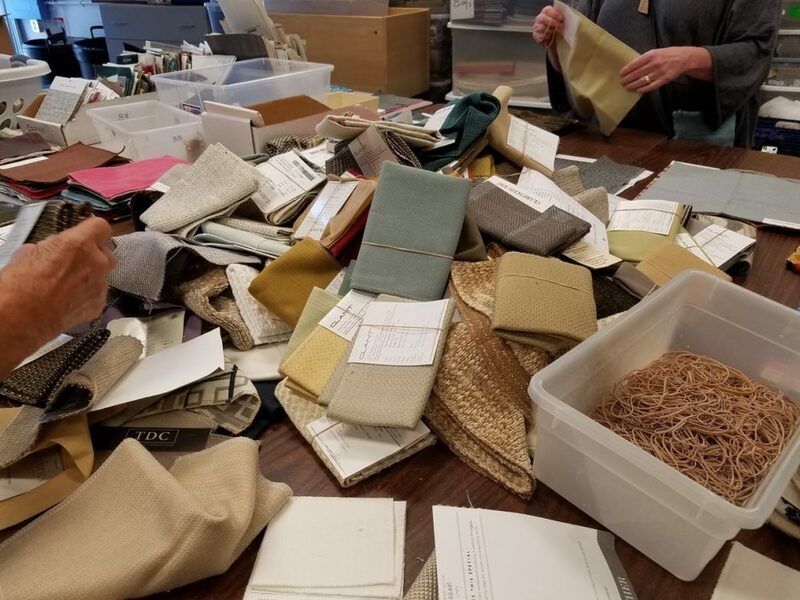 After I wrote a blog post about Hannah Cranch’s weekly trips to the Design Center in San Francisco, quite a few people–including long-time FabMo customers–told me they were amazed to learn how hard the collection work was. 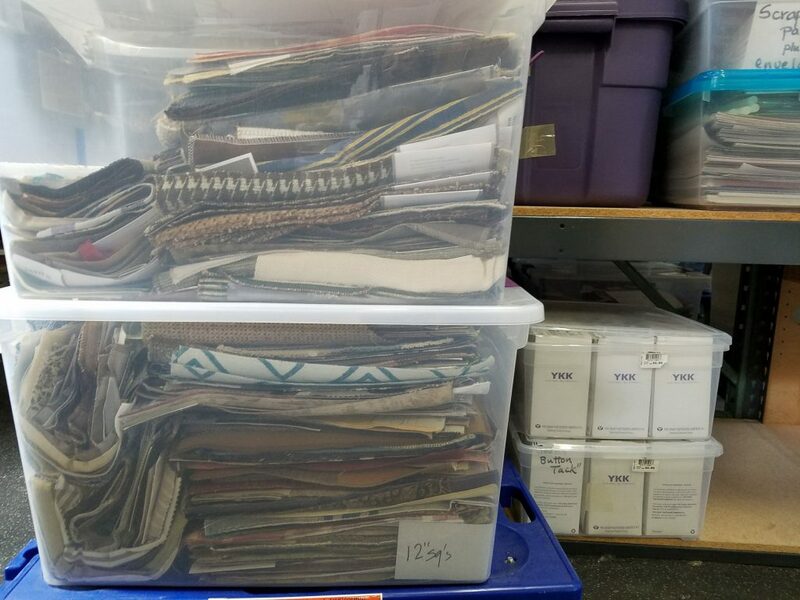 Many others wanted to know what happens to the fabrics after they make their way to FabMo’s warehouse. Well, today I want to fill you in about the next step in these fabrics’ journey: the sorting. Hannah and her volunteer helper then drive back to FabMo’s warehouse in Mountain View, where they unload the truck’s content into a back room. The bags wait there for the next sorting event. 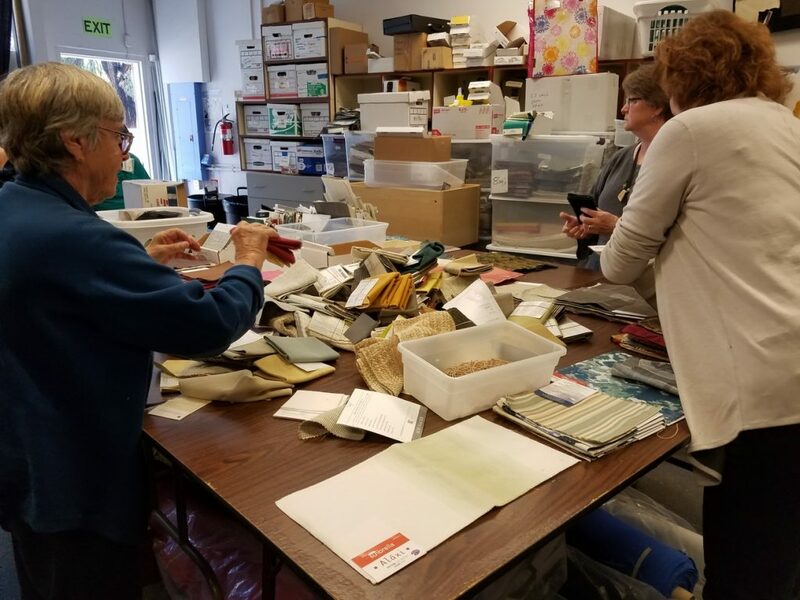 Every week FabMo hosts a few hours of “Regular Sort.” This “Sort” is a gathering of several volunteers (usually around eight), who open the bags Hannah brings. The volunteers spill the content of these bags onto big tables at the center of the room. Then they start unfolding the pieces and sorting them by size. A “Regular Sort” typically lasts three to four hours. The volunteers stand on their feet for most of that time. I can attest that this sometimes takes a toll on the body, especially if you have back issues! Once the volunteers arrange everything by size, they carefully place each pile into a plastic box, which they clearly label. They store the boxes on shelves with similar-sized fabrics. 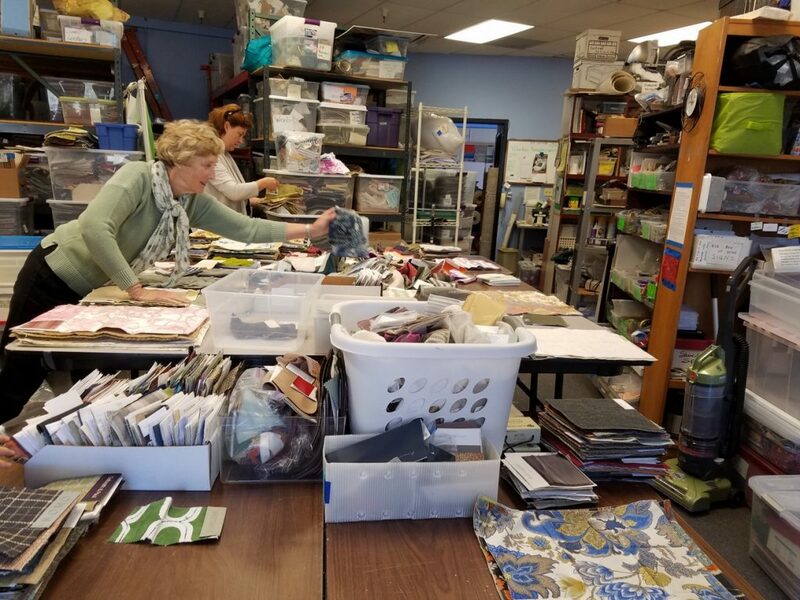 By the time the volunteers complete a “Regular Sort,” they have emptied all the bags Hannah collected on Monday, neatly sorted and packed all of the fabric pieces she brought, and placed all the boxes on their rightful shelf. The fabrics wait there for the next step in their journey: The Regular Selection Setup. So what is “gack,” you wonder… Well, not all fabrics are created equal. Many textile designers design beautiful pieces. 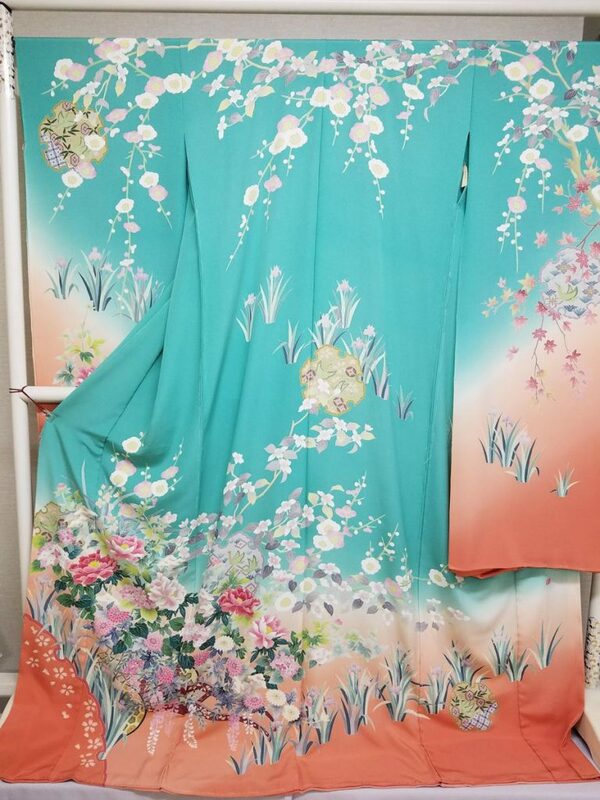 Some, however, come up with textiles that are … uhmm … less exciting… For every beautiful and luxurious piece that comes from the Design Center, there is one that is just … not. Some pieces are so drab, in fact, that they are unlikely to find forever homes even among sustainable-fabric enthusiasts. Those usually come in shades of beige and brown, are synthetic or have boring textures. Some are torn, cut or stained. FabMo jargon (yes, there is such a thing!) refers to these as “gack”. FabMo customers never see these pieces. The larger ones go to resale stores to be sold there. Some are left on “free” racks outside FabMo. 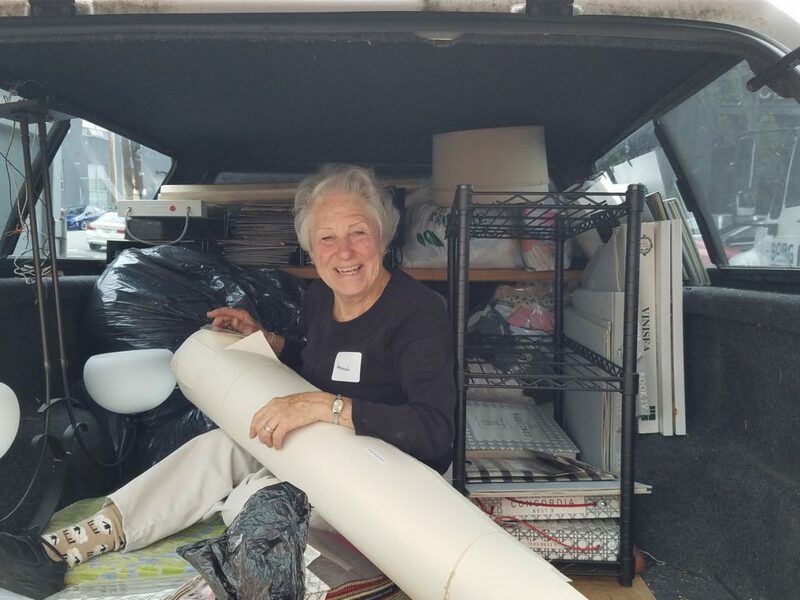 Volunteers take some pieces home, to use for things like pet bedding, stuffing or as rags. Everything else goes to a fabric recycling facility. 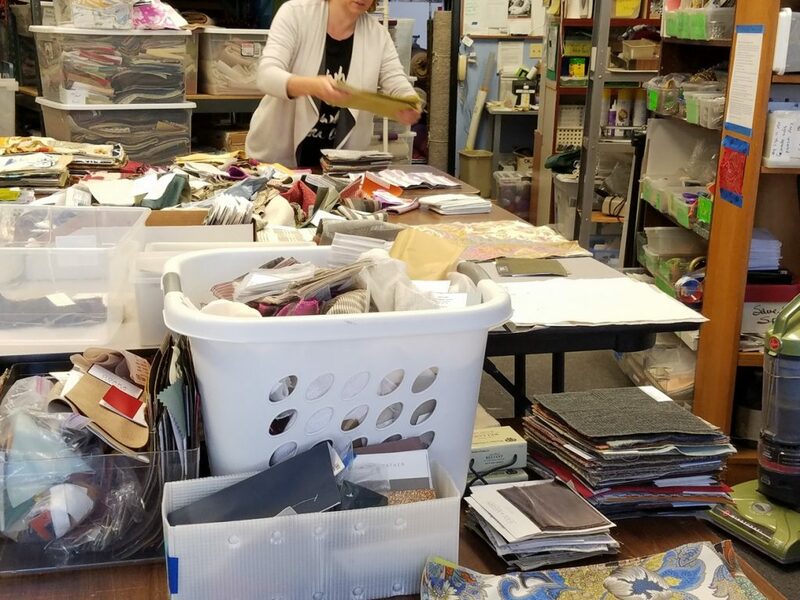 If you live in the California Bay Area and are interested in supporting FabMo’s efforts to save fabrics from the landfill, consider volunteering a few hours of your time! Sorting is fun, and an entire community will thank you for it! 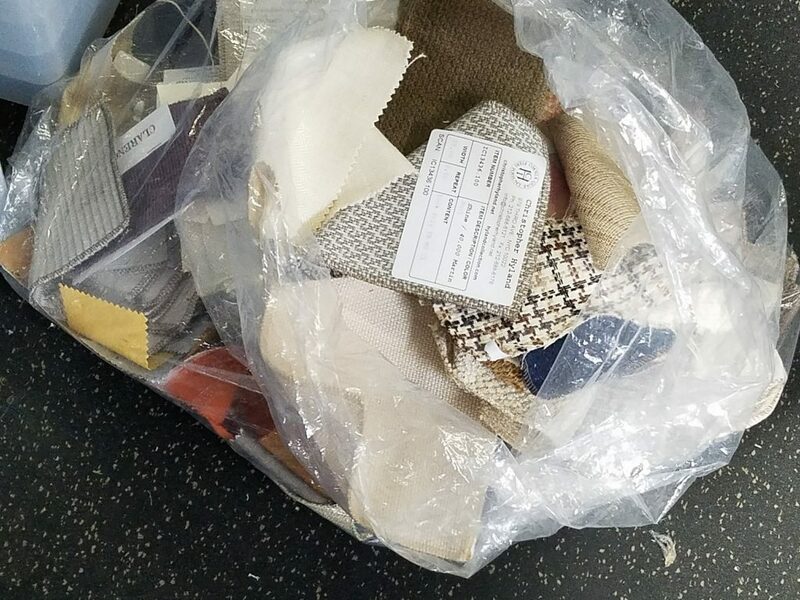 Exactly two years ago I came home with a small stash of beautiful upholstery fabric samples. Little did I know how quickly and profoundly these textiles would change my life! Today I want to tell the amazing story of FabMo, the non-profit organization where I acquired those samples, and the inspiring story of it’s two co-founders, Hannah and Jonathan Cranch. One day, during one such visit, they saw a man toss a big trash bag into the dumpster. The bag tore open, spilling out a bunch of gorgeous fabrics. 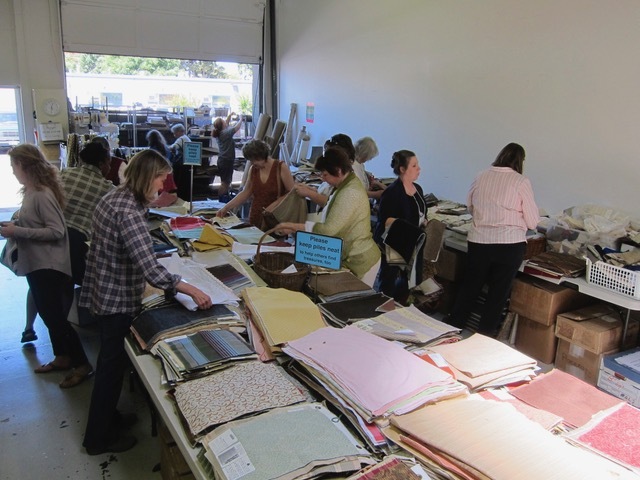 It turned out that in preparation for the open houses, the showrooms had to make room for newly released fabrics, which meant getting rid of all the discontinued textiles. These exquisite, expensive designer fabrics, which were displayed but never used, were thus headed for the landfill. Hannah, as an art teacher, knew her fellow teachers would salivate over such a treasure, so she began the quest to save these resources. She visited showrooms and spoke with key people, asking for some fabrics, and they gradually agreed to give her some. Each time, she returned home with a bag or two full of lustrous samples, which she distributed to Palo Alto teachers. As she gradually built relationships, the amount of material she acquired began to grow. Soon, she and Jonathan started supplying five school districts, and passed some fabrics on to the Children’s Theater, as well. Hannah later learned that someone named Steve was visiting the showrooms every Monday to collect discontinued fabric samples, which were then picked up by a charitable organization run by a group of nuns. 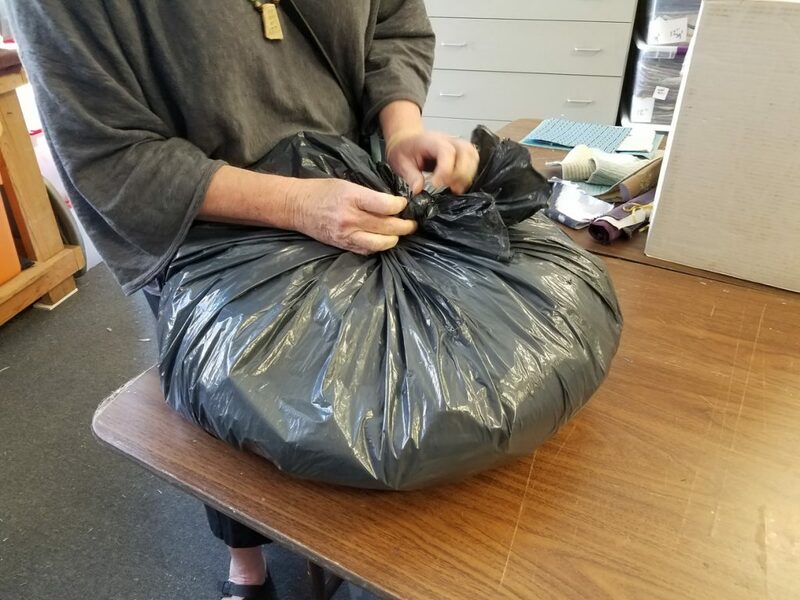 One day the charity did not come by to pick up, and so showroom workers asked Hannah, who was fortuitously at the Design Center at that moment, whether she wanted the fabrics. She certainly did! As it turned out, the charity never came back, and Hannah began a weekly pickup from then on. With the sudden increase in quantity, the picture changed dramatically. At essentially the same time, in summer 2007, Palo Alto schools closed for the summer. Hannah and Jonathan were unable to distribute the growing amounts of fabrics they were collecting. They published notices on Freecycle, Craigslist and other online venues, and began compiling an email list of interested people. 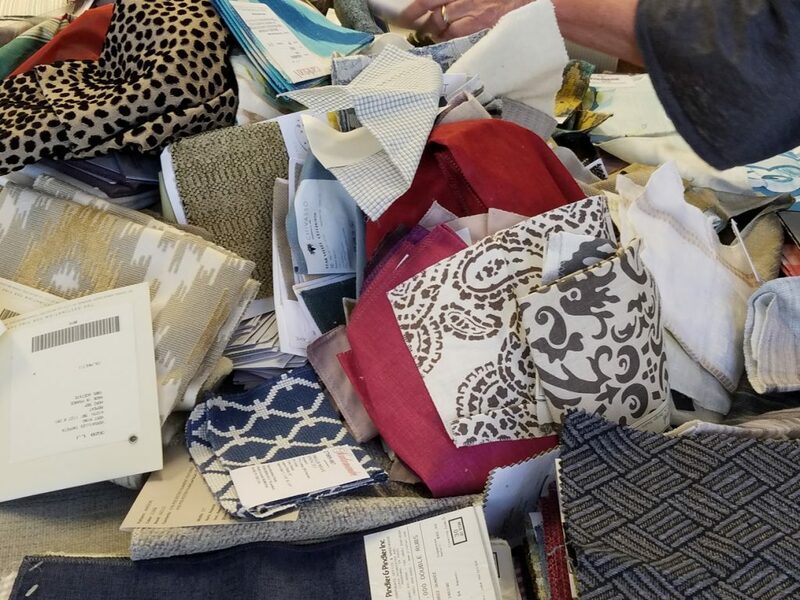 Soon after, they set up five tables in their living room, filled them up with materials, and invited these interested fabric-lovers to come over and pick whatever they wanted. Before long this became a recurring event. Originally, Hannah and Jonathan distributed the materials they gathered. They were the ones deciding what resources to give each school/theater. Once they allowed people to come over to their house and pick on their own, however, they could no longer think of it as “distribution.” They decided to call these “selection events” instead, since patrons got to choose their own treasures. At first, their living-room events lasted two days. As the amount of fabrics kept growing, they were extended to three. Soon, the living room wasn’t big enough for everything. Hannah and Jonathan set up yet more tables in their family room. But the rescued samples kept accumulating. 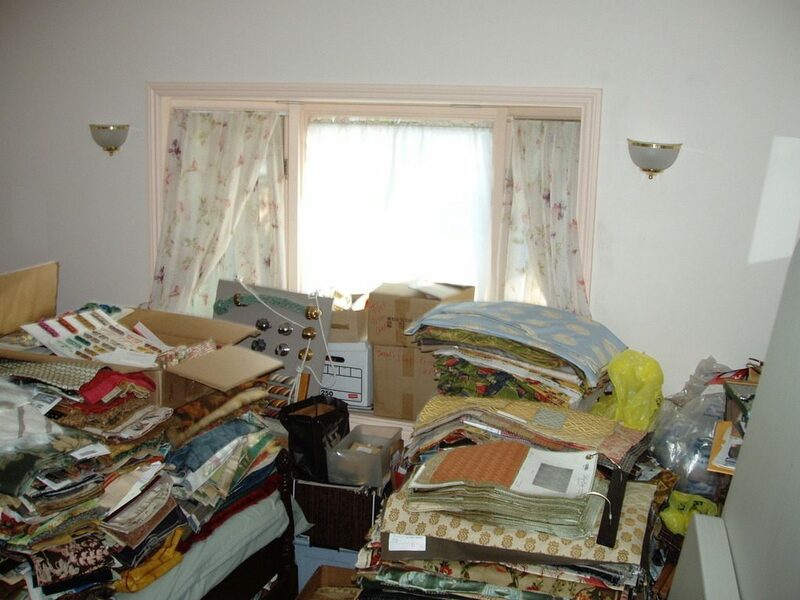 In no time they filled one spare bedroom, then another, until all the bedrooms in the house were full of textiles and other materials. 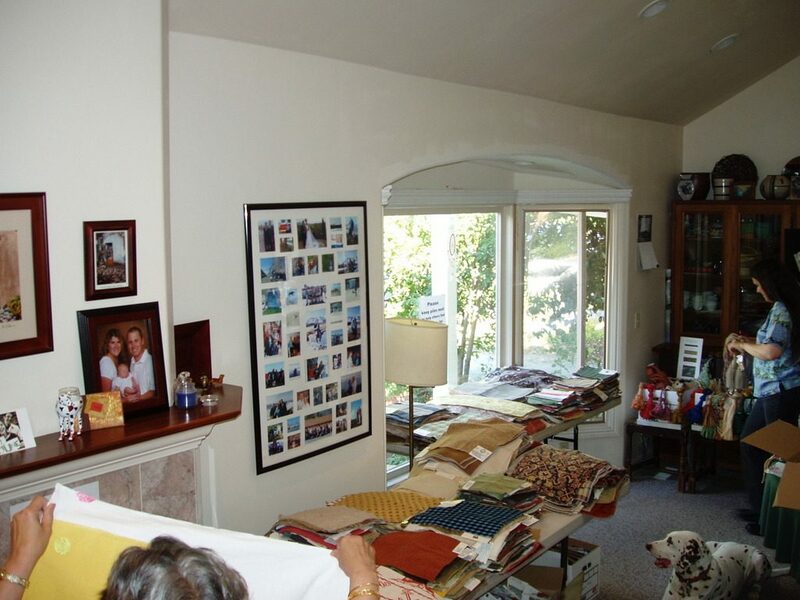 Hannah and Jonathan began holding regular selection events, timing them to open up a guest room as needed. Their email list, initially limited to about thirty people, kept growing. Before long, some one hundred and seventy people came by every month. Some were hesitant to enter a private house. Others, however, came regularly. Some of the latter offered to help pay for the gas for Hannah’s collection trips to SF, so Hannah and Jonathan put up a donation box to help finance their drives. Then someone offered to help take care of welcoming guests. One day, when Hannah, who was also co-owner of a catering business, was too busy with an event, Jonathan took that woman up on her offer. From then on the Cranches relied more and more on volunteers to help them with the many tasks of gathering, sorting and distributing. They started documenting who came to their house, and, in order to limit crowding, began setting appointments. 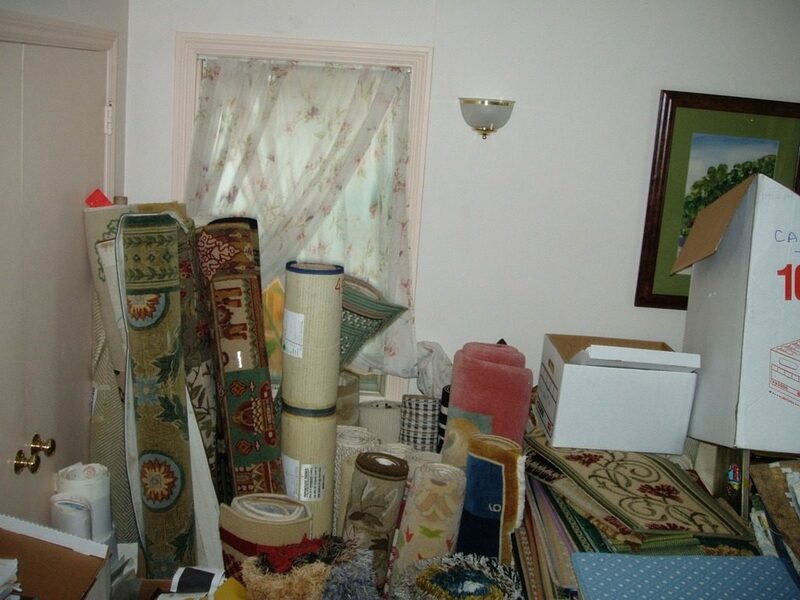 In 2009, after years of making fabrics available from their private house, Jonathan learned that their home insurance would not cover such large gatherings. Although the Cranches distributed everything for free, the insurance considered what they were doing as a business. So they found a small shared space in Palo Alto where they could hold Selection Events, but which had very little room for storage. Six months later they moved to a bigger warehouse on Old Middlefield Road. Later they added another warehouse. That same year FabMo was born as a public benefit corporation, and in 2010 was granted 501(c)(3) status. FabMo was now officially a non-profit organization! The name FabMo is short for Fabrics and More, as by then the Cranches rescued many different materials. 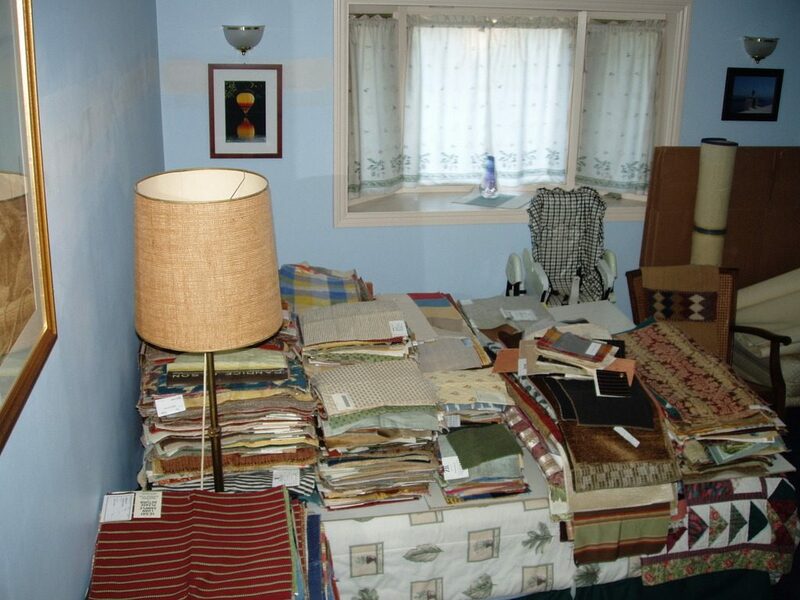 In addition to fabrics, they also saved wallpapers, trims, tiles, leather, carpets and so on. Since then, FabMo’s activities have continued to expand. Nine years ago, a regular attendee suggested creating an event for people to showcase items they created with FabMo materials, so as to inspire others. That’s how the Holiday Boutique came about. In 2015 FabMo moved into their current location in Mountain View. They regularly hold monthly three-day Selection Events, as well as 8-10 Special Sales a year. 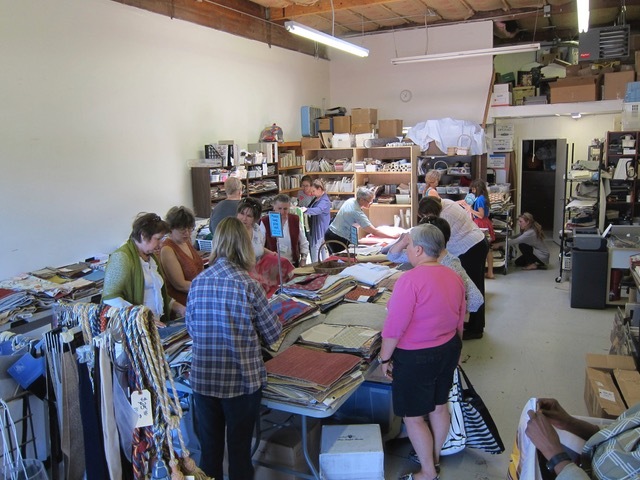 In 2014 FabMo started holding regular events in Santa Cruz as well, with an active volunteer and consumer base there. They also hold Selection Events in Vallejo, as well as in different Bay Area Tech Shops. FabMo has a regular presence in at least four fairs every year (MakersFaire, San Mateo County Fair, and two Earth Day Fairs). 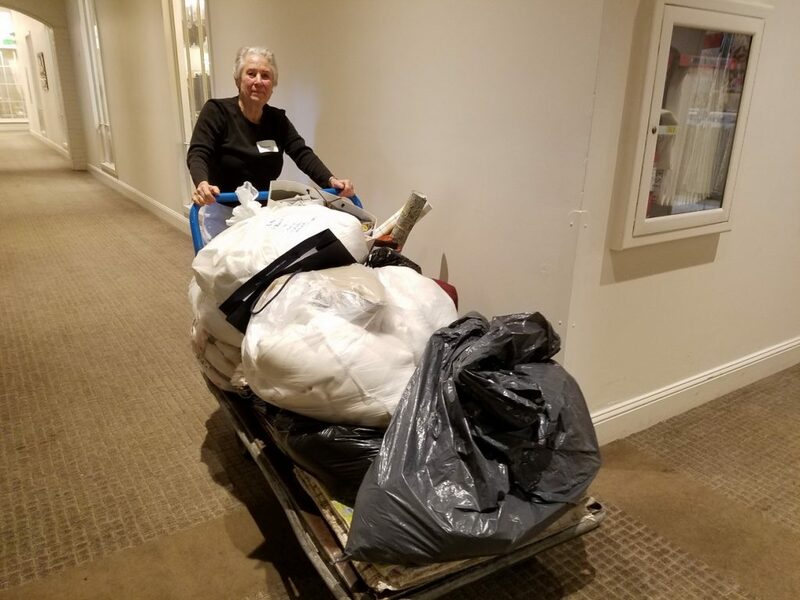 These days, FabMo rescues more than 70 tons of materials every year from Design Centers in San Francisco and San Jose, and from other miscellaneous sources. They make these amazing resources available to creative souls all over the Bay Area and beyond. More than 8,500 people are signed up to their mailing list, with about 300 coming to collect treasures during each Selection Event. 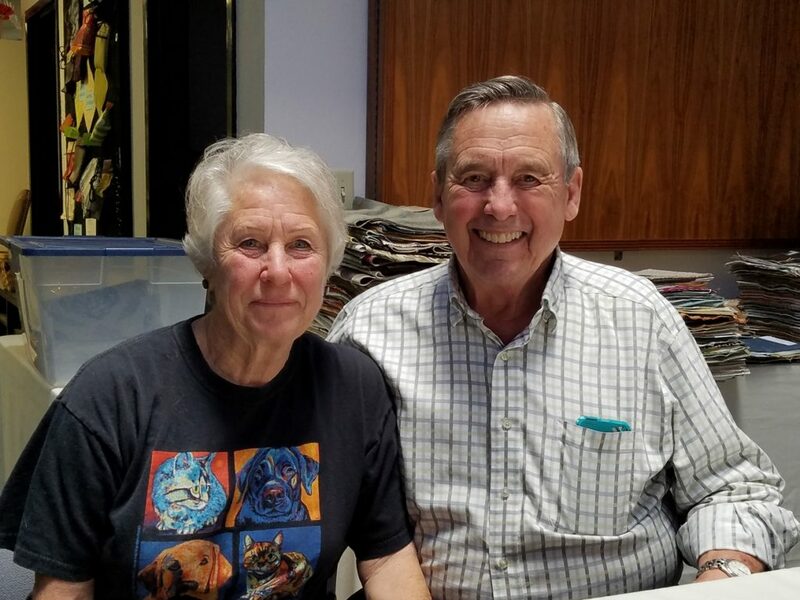 Hannah and Jonathan continue to be very involved with the organization relying on an active Board, a growing family of several hundred volunteers, and textile aficionados, who, like themselves, appreciate the creative and environmental impact of this amazing endeavor. People come from Hawaii, the Pacific Northwest, Michigan and beyond to attend, determining their own schedule based on FabMo’s. To this day, FabMo distributes fabrics for a suggested donation. It trusts patrons to give what they can to help keep the project running. Costs of maintaining such a business in the Bay Area are sky-high, as are utilities and fuel. Teachers still receive many of the materials for free. 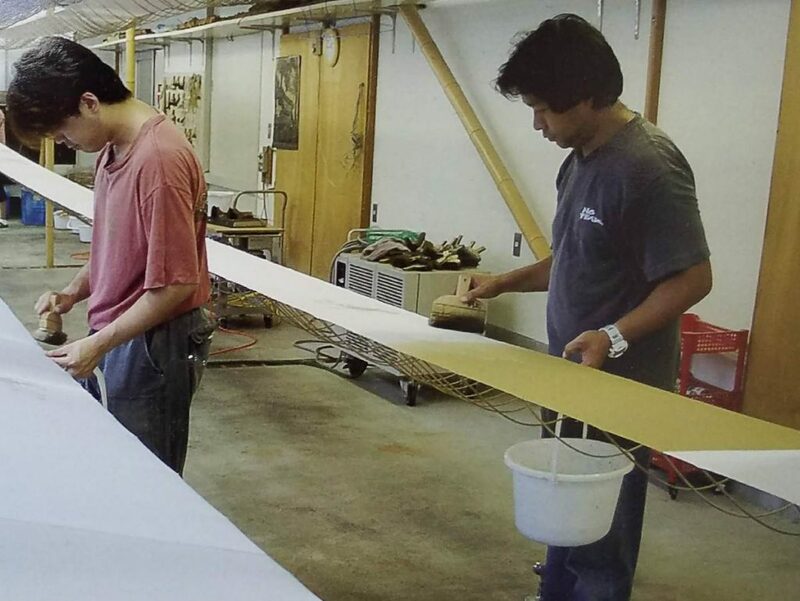 FabMo only sells Special Sale materials, but even then for low prices. Hannah and Jonathan didn’t plan any of this. They simply couldn’t stand to see fabulous textiles thrown away and wasted, and before they knew it, FabMo had appeared. What started as a small project of love run by two individuals, turned into a collaborative effort of a creative, eco-friendly community, a family of sorts. But it still remains a not-for-profit project of love. 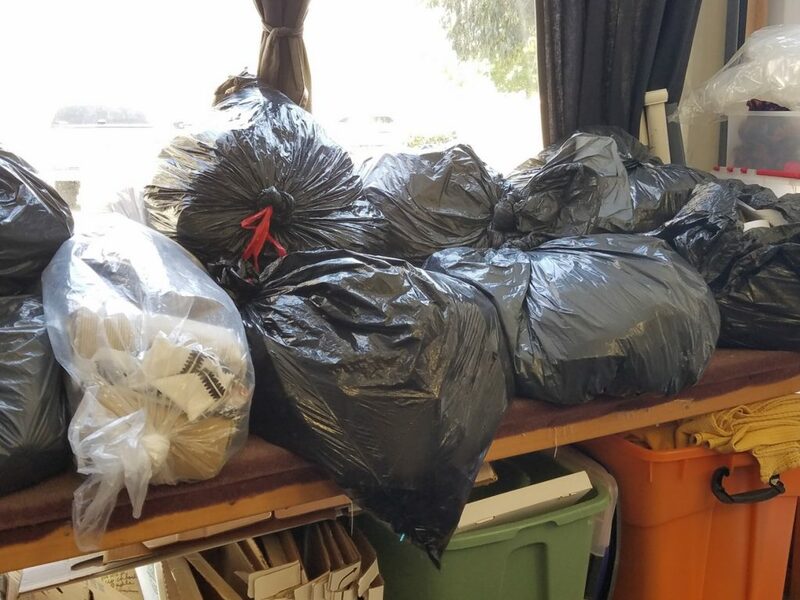 FabMo’s dedication continues to keep tons of precious resources out of the landfill. It also progressively builds an entire community of like-minded people who care about the environment. Likewise, it encourages the creativity of numerous others. The Cranches certainly changed my life, re-sparking my own long-suppressed creativity. Now, people from all over the United States are starting to ask how to establish similar organizations. The Cranches even received a few inquiries from overseas. Imagine how many resources could be rescued if every community had a FabMo! Imagine all the creative things people could come up with! To learn more about FabMo or sign up to their mailing list check out their web page: http://www.fabmo.org/fabmo/Home.html. You can also like their Facebook page: https://www.facebook.com/FabMo. And, if you live in the Bay Area, make sure to come check out this year’s Boutique. You will not only be able to buy one-of-a-kind, earth-friendly and locally-made pieces of art, but also support this amazing non profit! A few weeks ago I wrote about the route my friend Monika Ryser took to become a textile designer. Today I’d like to briefly describe what she told me about how fabrics are made. Please note that this describes the making of woven fabrics. Knit fabrics are created somewhat differently. Fabrics begin their journey as raw materials. Those include plants (such as cottons or flax), animals (sheep, silkworms), or synthetics (man-made materials). These raw materials are collected/harvested, and are then taken to spinning facilities, where they are separated/combed into fleece. From the fleece, the fibers are spinned into yarn/thread. Over the last several decades most of the world’s spinning facilities have been located in third-world countries. After the threads are made, they are turned over to weaving mills, to be woven into fabrics. When Monika was working at such a mill in the later 1980’s, threads were imported to first world countries, where they were shown in special exhibitions. 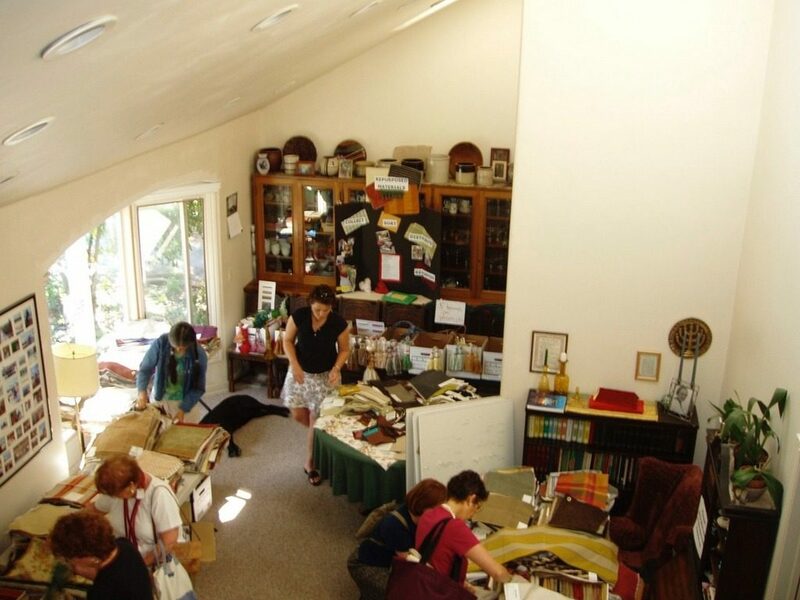 Representatives from different weaving mills went to these exhibitions to select threads. 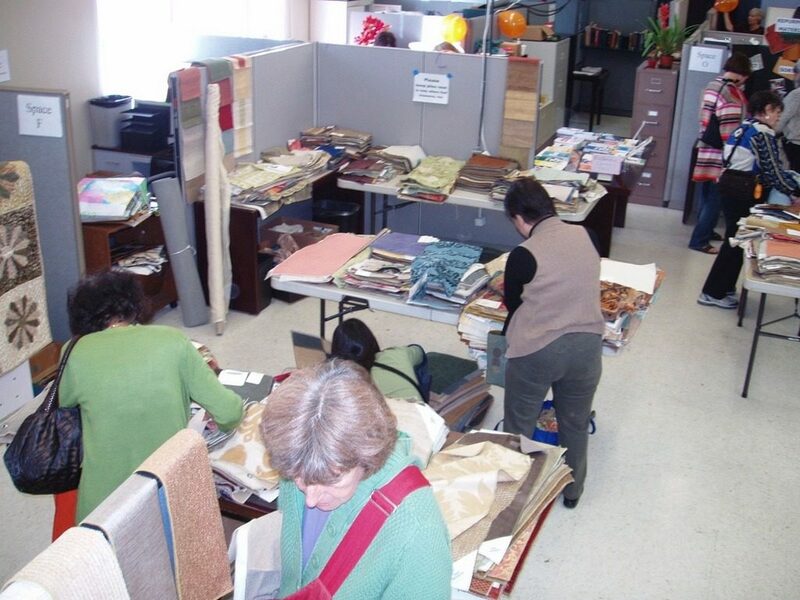 They often met with their customers first, to hear what kind of fabrics they needed. They then chose threads based on those needs. 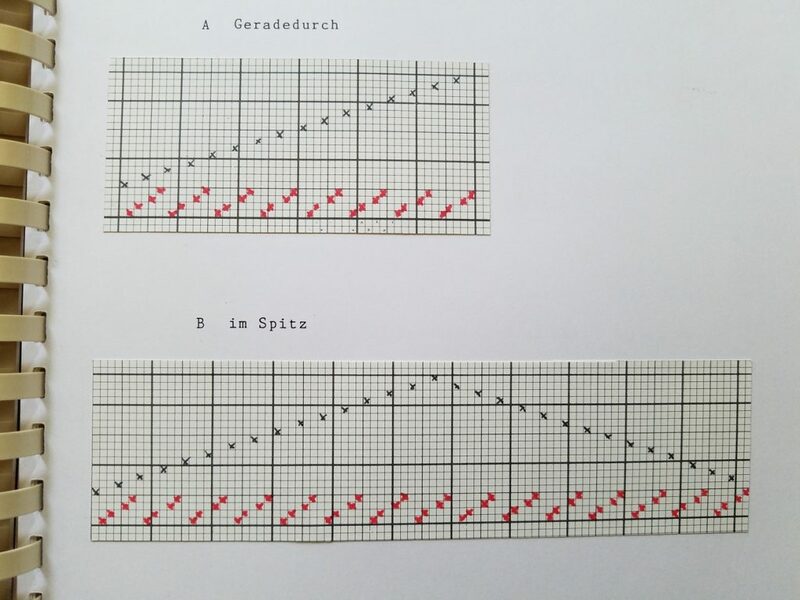 The weaving process itself requires the combination of vertical threads (called warp) with horizontal threads (called weft), and is done on a loom. Since the Industrial Revolution, most of the world’s commercial fabrics have been made on automatic industrial looms. When Moika worked in a mill, mills first wove short samples, about 100 meters long, of 20-30 possible designs for each of their customers. They sent these samples to the customer for evaluation. 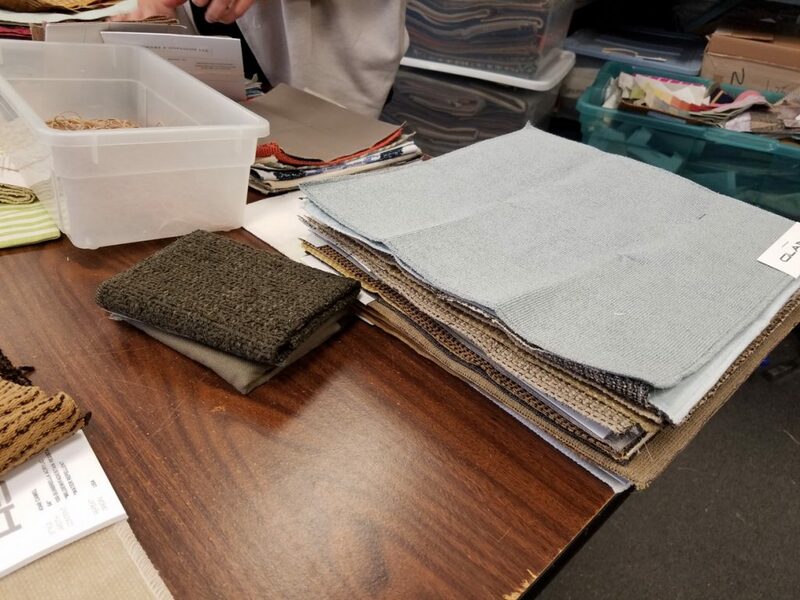 Once the customer chose the sample that best fit their needs, the mills went into full-mode production, and wove thousands of meters of the selected fabric. The weaving process is noisy and dirty. The industrial looms are so loud, that if long-time weavers don’t use earplugs religiously, they often end up damaging or losing their hearing. Yarns shed a lot of lint in the weaving process, so mills are often full of dust. No one knows the health effects that breathing this dust has on workers. Because of the noise and dirt, the unhealthy working conditions, and the cost of labor, most weaving mills, too, have moved to third-world countries in the last few decades. The Swiss mill where Monika worked, for example, was shut down long ago. 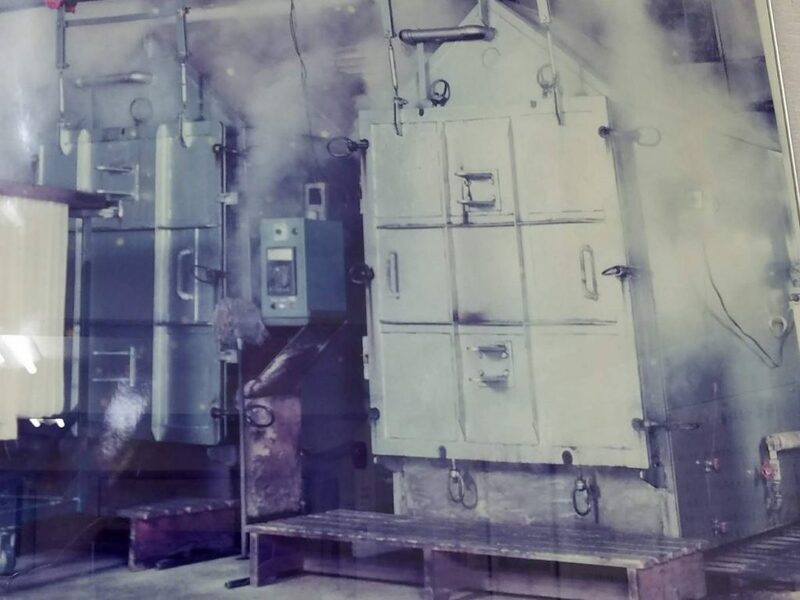 It is now hard to find weaving mills in first world countries, and the ones that did survive often weave specialty items, such as car safety belts. 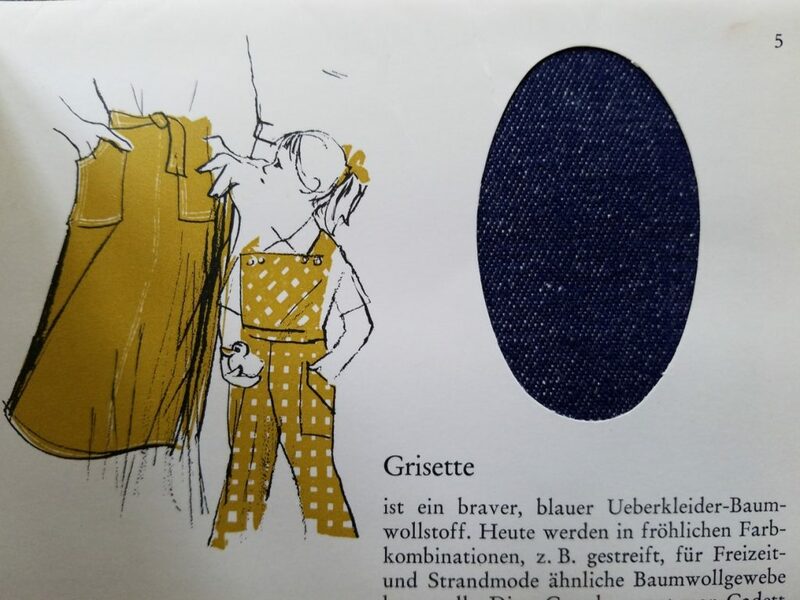 A freshly-woven fabric is called greige. It is full of impurities, dirt, and particles. Often, it is the color of the raw materials, mostly dirty white or beige. Plaited fabrics are an exception, as they require the threads themselves to be dyed before they are woven. Once off the loom, the fabric needs to be processed. 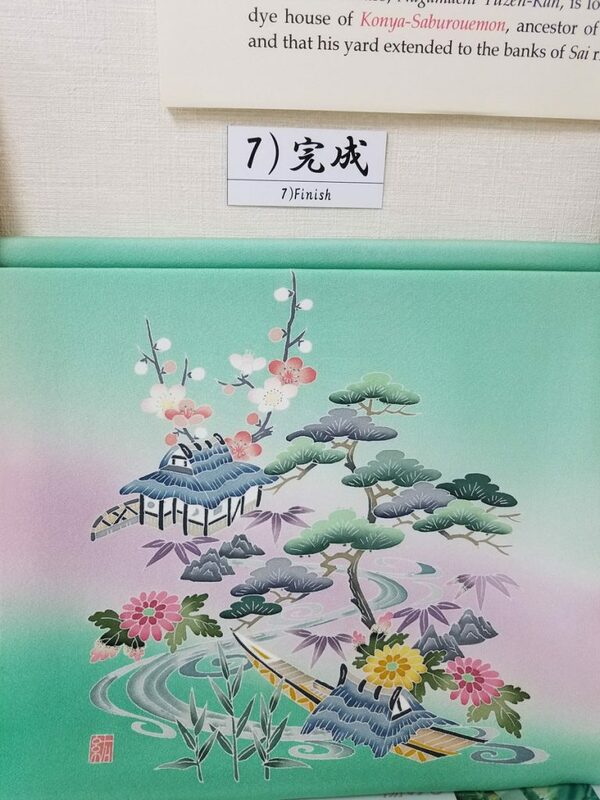 First, it needs to be cleaned, to remove both natural oils, waxes and dirt, as well as materials that were added during the weaving, such as potato starch or glue. 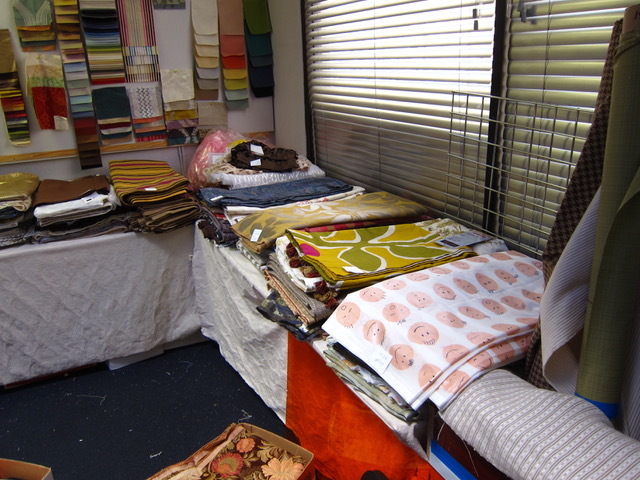 After the cleaning, some fabrics are dyed or printed. The dying process is different from one type of fabric to another. Different textiles are treated with different chemicals to make them softer/stiffer. Some fabrics undergo both chemical treatment and dying. 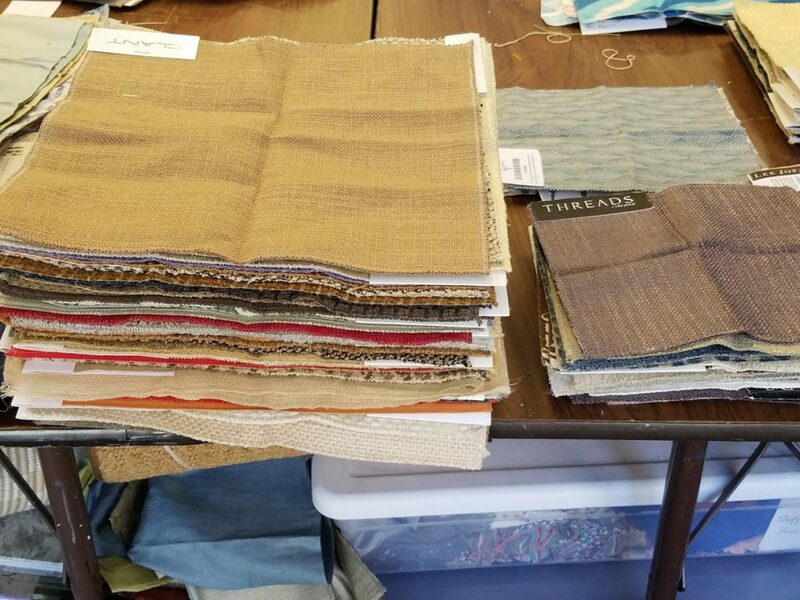 When the fabric is complete, it is ready to be cut and made into the many textile products we see all around us (including all my ANY Texture items :-)). Fabric is everywhere. Most of us are wrapped in it the minute we come out into the world, and again when we depart. We wear fabric, sit on it, sleep in it, step on it. We wipe our mouths and bodies with it, and use it to clean our kitchens. We decorate our houses and persons with it, wrap it around our necks, and carry it with us shaped into accessories. It’s all around us, everywhere, all the time. And yet, instead of being grateful for fabric, we often barely notice it, and hardly ever think of it. We take it for granted the way we take breathing for granted, or our own mothers. And we never, ever think of the many people who labor unseen to make fabric possible. I’ve been thinking about fabric a lot since I started sewing seriously almost two years ago. I’ve been admiring the richness of the fabrics I use, the great diversity in their textures, colors, designs and feel. The more I work with them, the more curious I become about their origins. Where did these fabrics came from?, I wonder. How were they made? What kind of knowledge, work, and creativity went into creating them? Who were the people who made them possible? Luckily for me, my friend Monika Ryser was able to shed light on some of the latter questions. 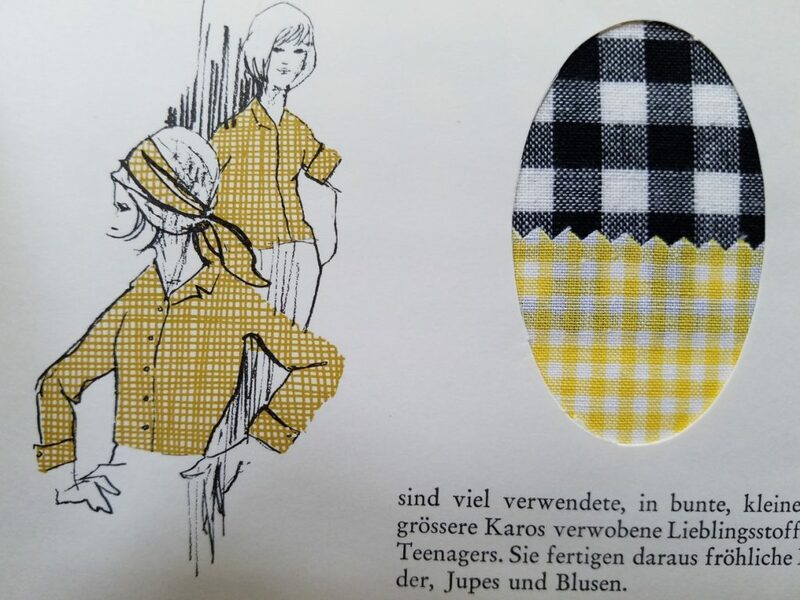 Monika comes from a long line of Swiss textile experts. Her grandfather and father were in the textile business, and so it was only natural that, as a young adult, she, too, joined the industry. 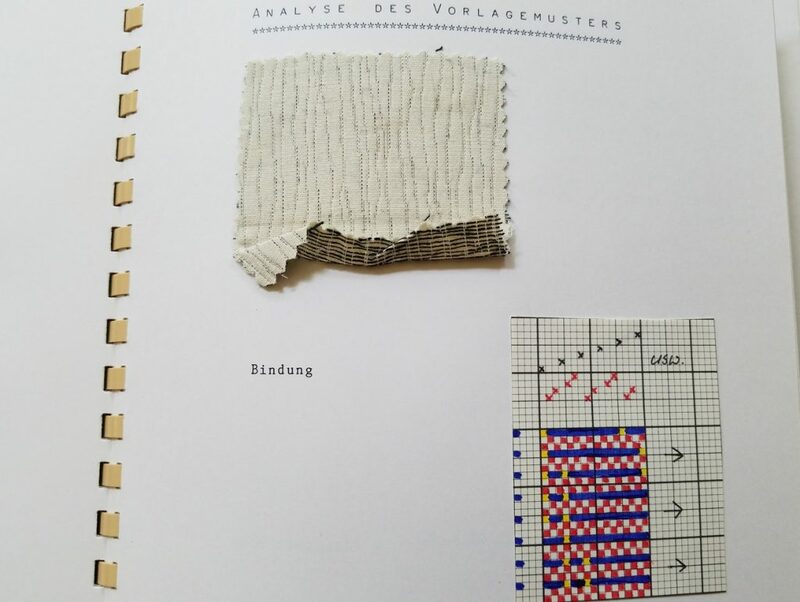 Monika’s experience illustrates how textile experts were trained in Europe in the late 1980’s-early 1990’s, and demonstrates what it took to become a person who made fabric. She also learned how to test the quality of already-woven fabrics . 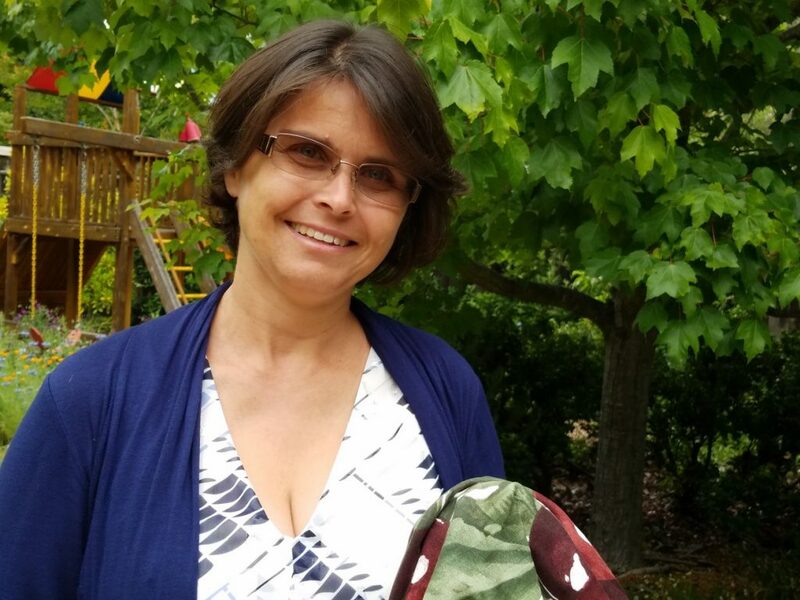 Once her apprenticeship was over, Monika went to Germany, where she interned for half a year at the Hoechst Company, working mainly with artists who designed prints for mostly synthetic fabrics. A Textile Designer: a person who either designed the technical components of fabric, or its looks. A Textile Mechanic: a person who could design, build and maintain the machines that made the textiles. A Textile Dyer: a person who specialized in fabric dyes, dying techniques, chemical treatments, and fabric printing. A Textile Salesperson: someone who specialized in selling yarn and fabrics to customers who made things out of them. Each of those options would have required a different course and detailed training and specialization. Monika chose the first option. 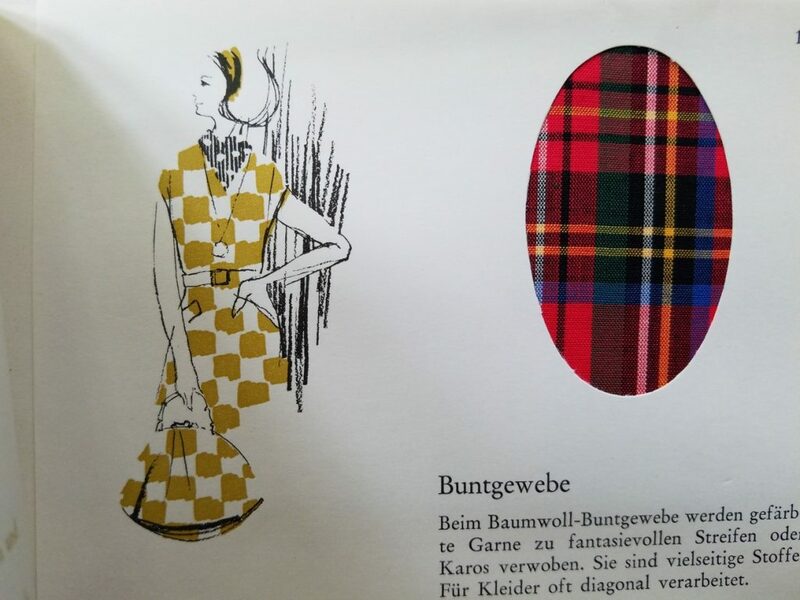 She enrolled in the Swiss Textile School (Schweizerische Textilfachschule Wattwil), where she spent another year and a half learning to be a Fabric Designer, specializing in the technical composition of fabrics. Monika jokes that whenever she tells people that she was a textile designer, they immediately assume she designed fashion. In fact, she was responsible for the basic composition of the fabric itself! Her studies covered topics that included information on the raw materials from which fabrics were made: where cottons were grown, how cottons from different areas were different, which sheep to use for wool, where they were raised, and so on. Monika also learned how to choose threads, which threads to use for which fabrics, how to weave different kinds of threads, or how dense the weaving should be. She learned what fabrics to use for which purpose, and how to determine how well they held up with use or in the laundry. 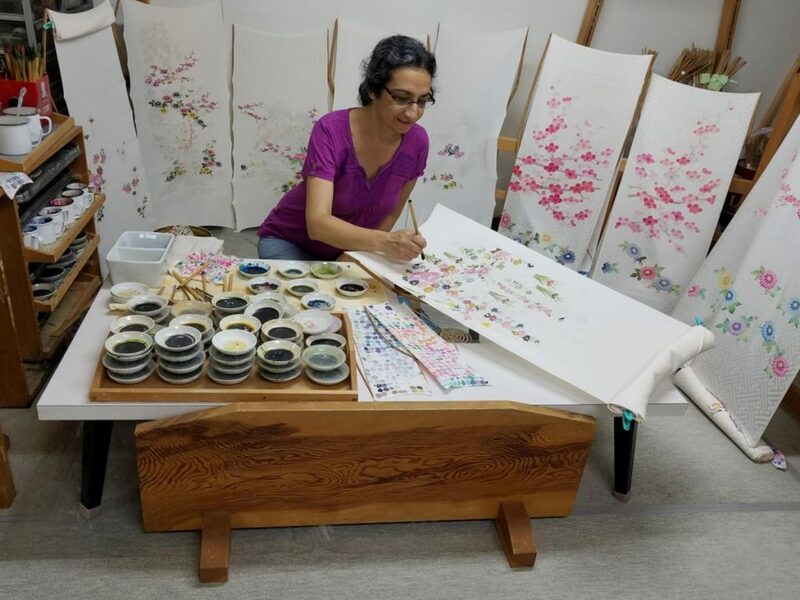 Altogether, Monika spent about five years learning her trade. 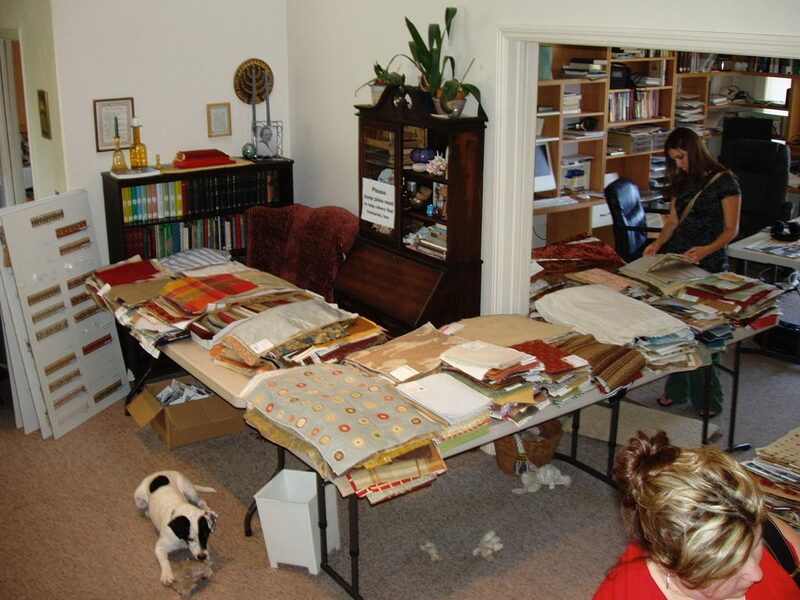 It took that long since creating fabric is a complex procedure that requires expertise in many different fields!